According to eMarketer, online video ad spending increased by 40% in 2010 and is projected to increase 39% in 2011, as more advertisers incorporate online video into their overall media mix. However, even with the explosive growth, online video still represents only a small portion of marketers' overall ad spend compared to their traditional advertising channels of television, radio and print. But new data in a research report from YuMe conducted by the Nielsen Company intends to change that. 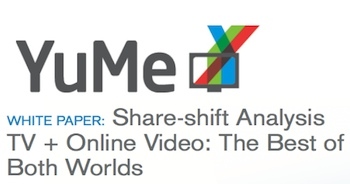 As part of its ongoing market research, YuMe set out to demonstrate that shifting a portion of a brand's ad spend, for example reallocating 5%, 10%, or 15% of a TV buy, to online video can not only improve reach, effective reach, and frequency, but can also lower the overall campaign CPM. YuMe suggests a holistic approach to media buying independent of which screen the ad appears and set out to demonstrate this in its latest market research, Online Video Share-shift Analysis, which incorporated Nielsen TV/Internet Data Fusion, to show that online video campaigns complement TV campaigns, and that the combined effect is yields even greater advertising effectiveness. I caught up with Travis Hockersmith, Director of Market Analytics for YuMe, at the YuMe roadshow in San Francisco to discuss the key findings of the share-shift analysis based on the selection of a representative consumer packaged good (CPG) food brand that invested $4.5 million in National TV spots (Network, Cable and Syndication) during the month of January 2010. Hockersmith says that Nielsen's new data set, Fusion, statistically fuses the TV and online panels to create a complete, or as he says, holistic video plan – which is really what agencies and advertisers want. This approach offers a lot of benefits and least of which, answers the question, "What percentage of my budget should I spend in online video and what exactly does that buy me?" Hockersmith notes that while TV continues to command the dominant share of viewers, as audiences continue to move online and to mobile devices, it becomes difficult to achieve a brand's desired reach and exposure in the fragmenting advertising landscape. "As online video is added to the mix, there's a lot of different benefits that advertisers realize, the most important of which is cross-platform reach. By that I mean, how can you get people to see your ad across multiple screens? So we know there's a major performance lift if you can get your TV spot in front of someone on a television and a PC screen, even more and more on a mobile screen, iPad screen, you name it. So as you add online video to the mix you get a nice lift, in that effect, in the campaign with no additional spend just by making the right decisions about where to pull from TV to put into online video." The share-shift data points out that when a viewer is exposed to a campaign across multiple screens, brand recall scores increase dramatically with multi-platform exposure and performance, from 62% for ads solely on TV to 82% for adds viewed on TV and online. A common question Hockersmith is asked is, "Do I need online specific video creative to run in online video spots?" "We have a lot of evidence that TV spots work great. TV spots have a high production value, they're very well tested, typically. They also can reinforce the message that you see on TV by having the same creative online. So we find that advertisers do quite well with TV creative in the online space. There's really not a need for online specific creative. We do see a need to sometimes cut back the length of a TV spot to run online. Fifteens typically work best. We can still run thirties in the online video space, but the attention span in online video space tends to be for fifteens." "It's the king because you have this lean-forward engaged audience calling up a piece of content, and then getting an ad in front of that piece of content. In banner, it's wallpaper, it's off to the side, it's somewhat of a distraction. But in-stream, as we refer to it, is where you get the highest user attention." "We are all still trying to figure out what percentage of television budgets make sense to put into online video and we think that we've quantified the effect that 5, 10, 15% level – we really believe that there's a strong case and a lot of hard evidence that suggests that 15% of TV spend should be moving into the online video space." Beet.TV: Measuring Video Impact with Nielsen's "TV Internet Data Fusion"
YuMe is a video advertising technology company that makes professional video profitable for publishers and effective for advertisers. Its robust ACE™ technology powers both its premium ad network and its industry-leading advertising management solutions, ACE for Publishers and ACE for Advertisers. YuMe’s premium ad network aggregates the best video content, representing hundreds of premium publishers. As a result, YuMe gives publishers and advertisers unprecedented reach, brand safety, contextual relevance, controlled syndication, and consistent delivery across all digital media platforms–Web, downloads, mobile, and IPTV. YuMe is a privately held company headquartered in Redwood City, CA and backed by Accel Partners, BV Capital, DAG Ventures, Khosla Ventures, Menlo Ventures and Intel Capital. For more information, visit www.yume.com, follow @yumevideo on twitter, or become a fan of YuMe on Facebook at www.facebook.com/yumevideo. To learn more, contact getresults@yume.com.